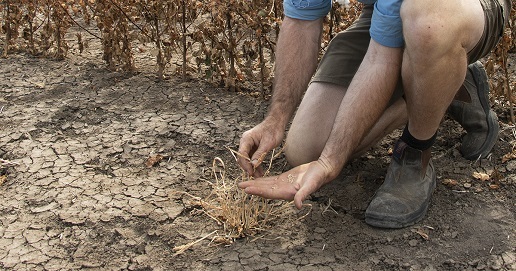 Awnless barnyard grass produces a large quantity of seed if it escapes weed control tactics, resulting in patches of potentially resistant weeds in cotton fields. A downside of the uptake of this technology has been the shift in the weed spectrum found in cotton fields. 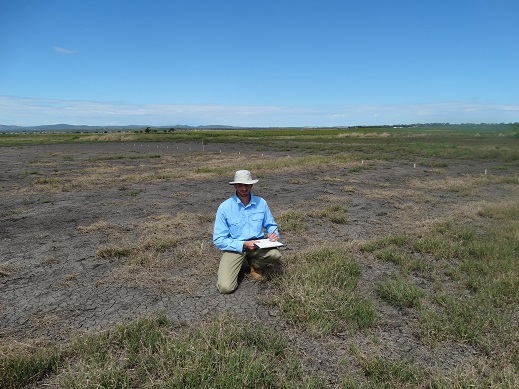 Queensland Department of Agriculture and Fisheries (DAF) researcher Dr Jeff Werth said growers had achieved better control of Cyperus sp. (nutgrass and other sedges), but surface germinating and glyphosate-tolerant species, along with reduced control of vines and legumes had found the new cropping system favourable. “This shift has taken years to occur and now we are seeing weedy patches establishing in cotton crops,” he said. Jeff Werth collecting data at the patch eradication trial at Hermitage Research Facility, Warwick. The dense patches of awnless barnyard grass seen in this image are the glyphosate-only treatments. They chose a dryland cotton field with a dense population of glyphosate-susceptible awnless barnyard grass (ABG) and used a low rate of glyphosate (250g/ha Roundup Ready) to simulate glyphosate-resistance with approximately 70 per cent control of the barnyard grass each time glyphosate was used. The treatments applied were designed to compare ‘glyphosate only’ with the ‘2+2&0 strategy’ to see the effect on ABG emergence and seed bank. The experiment ran for a four-year cotton-fallow-fallow-cotton rotation. “When glyphosate was used without applying any other weed control tactics, weed emergences were almost always higher than where multiple tactics were used,” Dr Werth said. Dr Werth said it took three years to really see the differences between the two main treatments, so persistence is required if you don’t see immediate changes in weed numbers. Eradication treatments applied early in the crop season were also the most effective in driving down the weed seed bank. The time taken to see a decline in weed populations is related to the longevity of the seed of different weed species. In a cotton farming system small seeded species such as feathertop Rhodes grass, windmill grass, fleabane and sowthistle generally last in the soil for 2–3 years; larger seeded species such as awnless barnyard grass and liverseed grass last about 4–6 years and harder seeded species like bladder ketmia and peachvine last 6–10 years. “It is reasonable to expect that the longer the 2+2&0 strategy is applied, along with early season eradication tactics, the greater the difference there would be compared to a glyphosate-only approach,” he said. The 2+2&0 strategy forms the basis of the Cotton Herbicide Resistance Management Strategy and is best applied in all cases to minimise the risks of resistance development. If a problem is detected early, the 2+2&0 can form the baseline response, and extra tactics can be incorporated to limit potential spread of the patch in the field, and drive down the seed bank.